Soil your pants in 3D. Predictably you'll be taking photos of the departed, using the 3DS's cameras in the process. The game also contains something called an AR Notebook, and although details on this are sketchy at the moment the idea of snapping three-dimensional augmented reality ghosts is enough to send shivers up our spines already. More information as it reaches us. I've never NOPE'd so hard at a concept in my life. This sounds absolutely horrifying. Definitely interested in this one. I first thought about a eShop game when i read the news. Will be interesting to see if this title makes it to the west too. It will be wicked if you can take pictures around your house and the show ghost coming out woodwork. O: It would keep you from those late night snacks tor sure. Sounds nice. Probably won't come to Europe. The 3ds needs all the games it can get. Will we see this in the west is the real question? If the wii version never came out then im not getting my hopes up. I'll just wait for Luigi's Mansion! That sounds like a great use of the 3D and AR. Hopefully it will get a western release or at least a fan translation like Fatal frame IV. but will it give enough content and replay value ? because AR cards got old fast. 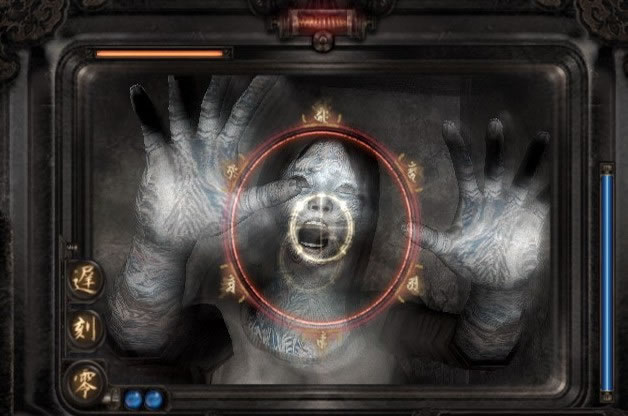 i loved the first 3 fatal frame games even though they made me scream. please bring this one to the U.S.! Sounds creepy, I'll keep my eye out for it. I just want a real Fatal Frame entry, localized. I agree with warioswoods, I too want a real game of the series, if I ever wanted to see real ghost I would had use my own camera and go to haunted places somewhere. I hope someone eventually crack the way to make good AR games. It's cool in concept, but even my kid's dinasour book is a way cooler in concept than in reality. I think the display needs to be on the retina ... and not retina in the corporally-confused Apple sense, but an actuall eyeball display. Well...anyone's house/apartment in the dark with this kind of AR game would be amazing...aswell as terrifying with headphones!!! Sounds interesting, as if you were in the game itself. I want to hear more details before I make any decision, but so far I'm looking forward to the completion of this game. I just hope that it will be released outside of Japan. Considering how bad Face Raiders and the AR games are on the 3DS, I'm gonna say no thanks. Where the hell is Fatal Frame 4 & 2 NOA? F that project rainfall crap, these are the games I really want! AR fatal frame? Man, this is going to be awesome! No, i meant: AWESOME! Still waiting? You mean Fatal Frame IV might still come to the US or do you mean still waiting as in that crazy person who still waits for a train on a long-abandoned track? ,,, Scary o.o... Looks good though... "hides under table with a flashlight"
Oh man, I hope it doesn't senses live ghosts in my house. 'Cause they're not supposed to be "live". Creepy. I like it. It would be awesome if they added a nightvision option in the camera so you can snap the photos in the dark. Insta-Buy. I was SUUUPER psyched when I saw that Fatal Frame screenshot. That would be AWESOME if the series was ported to 3DS or something. If it's a spin-off, I can only hope the quality will be just as good as the other games. And I hope it doesn't rely completely on AR to make ghosts appear in your house. The atmosphere those games build up through the environments is half of what makes those games work.